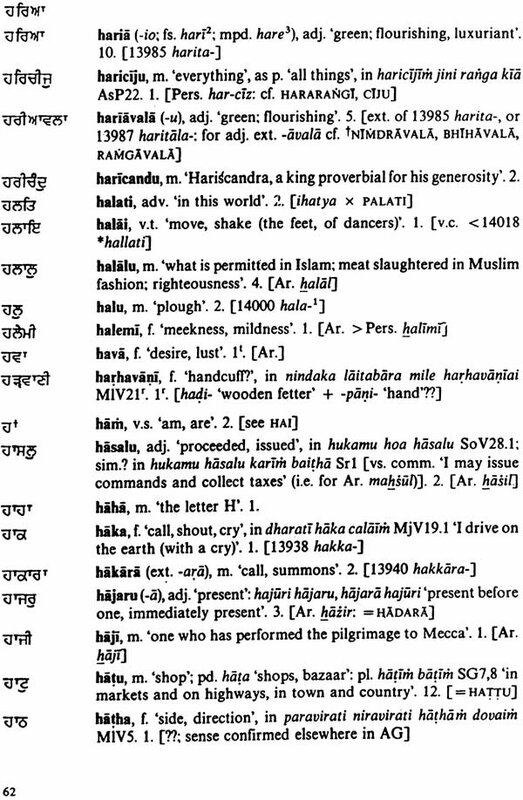 This is a glossary of the words found in the hymns of Guru Nanak (1469- 1539) contained in the Adi Granth, the Sikh scriptures compiled in the Gurmukhi script by the fifth Guru Arjan in 1604. It also includes all additional words found in the couplets by Guru Nanak's successor Angad, in those by the succeeding Gurus incorporated into some of Guru Nanak's longer hymns, and in the compositions attributed to Shaikh Farid. 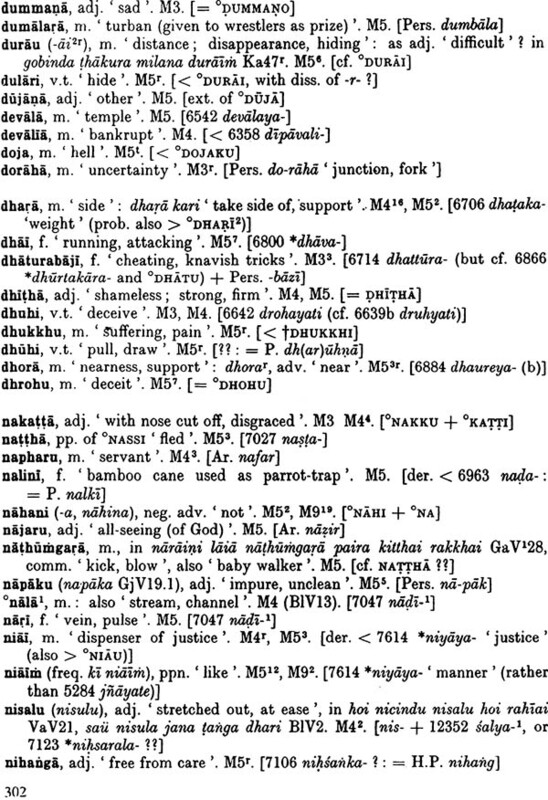 There are about 6000 entries altogether, though not all are independent words, covering one-fifth of the Adi Granth. Words are given in both Gurmukhi script and romanized transcription, with English definitions, frequency-counts, and etymologies. The hymns of Guru Nanak have a very special importance as the sole authentic record of the teachings of the founder of the Sikh religion. So his compositions continue to have a living spiritual significance, while much of the religious literature of medieval India is now of historical interest only. This significance is in itself the principal justification for the production of this glossary. 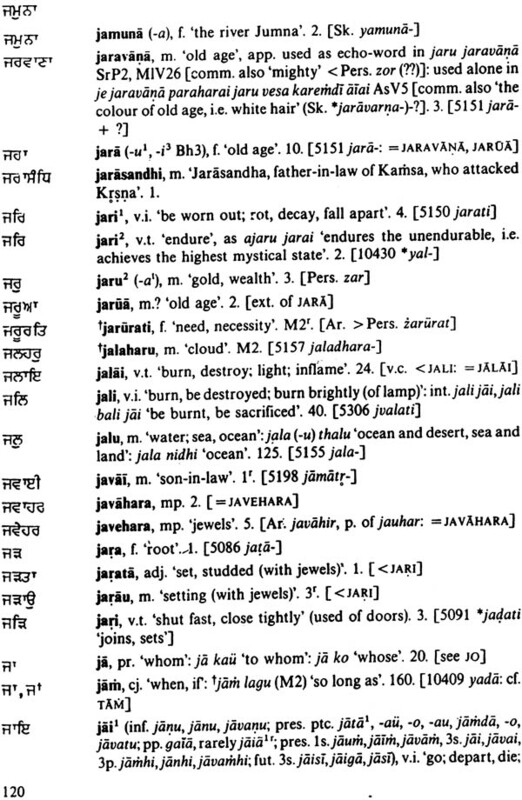 Academically the principle purpose of the glossary is to further the integration of the study of the Sikhs with the mainstream of Indo-Aryan philology and linguistics. 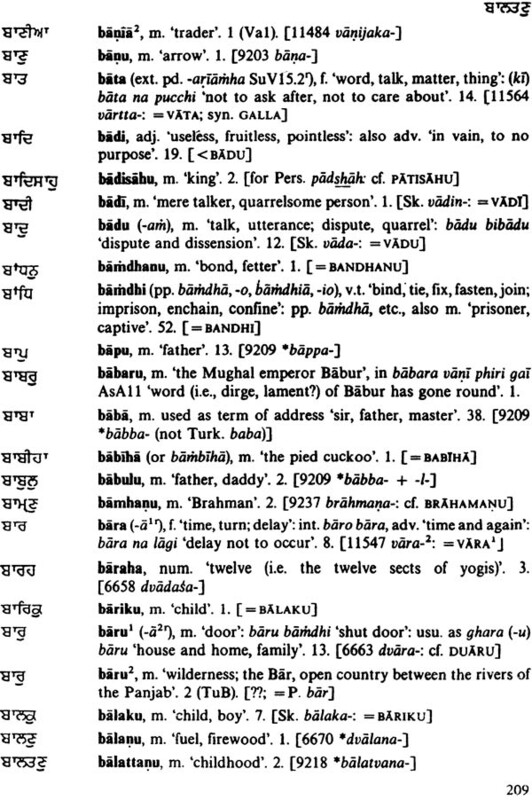 In practical terms the glossary will be useful to those who want to read Guru Nanak in the original. This is a glossary of the words found in the hymns of Guru Nanak (1469-1539) contained in the Adi Granth, the Sikh scriptures compiled in the Gurmukhi script by the fifth Guru Arjan in 1604. It also includes all additional words found in the couplets by Guru Nanak's successor Angad, in those by the succeeding Gurus incorporated into some of Guru Nanak's longer hymns, and in the compositions attributed to Shaikh Farid. There are about 6000 entries altogether, though not all are independent words, covering one-fifth of the Adi Granth. Words are given in both Gurmukhi script and romanized transcription, with English definitions, frequency-counts, and etymologies. Quite apart from their great literary and linguistic interest, the hymns of Guru Nanak have a very special importance as the sole authentic record of the teachings of the founder of the Sikh religion. So his compositions continue t have a living spiritual significance, while much of the religious literature 0, medieval India is now of historical interest only. This significance is in itself the principal justification for the production of this glossary. It also has a practical purpose. Movements of emigration in this century have brought about the spread of the Sikh community far beyond its homeland in the Panjab. There is therefore an increasing number of those who - whether within or outside the community -desire to read Guru Nanak's hymns in the original, but are more at home in English than in Panjabi. Of course Guru Nanak, like any major religious teacher, does really need to be studied in the original language. But this is no easy matter for those who do not have a sufficiently fluent reading knowledge of modern Panjabi to allow them easily to make use of the existing dictionaries of the Adi Granth. It is hoped that some of their difficulties will be eased by this work. 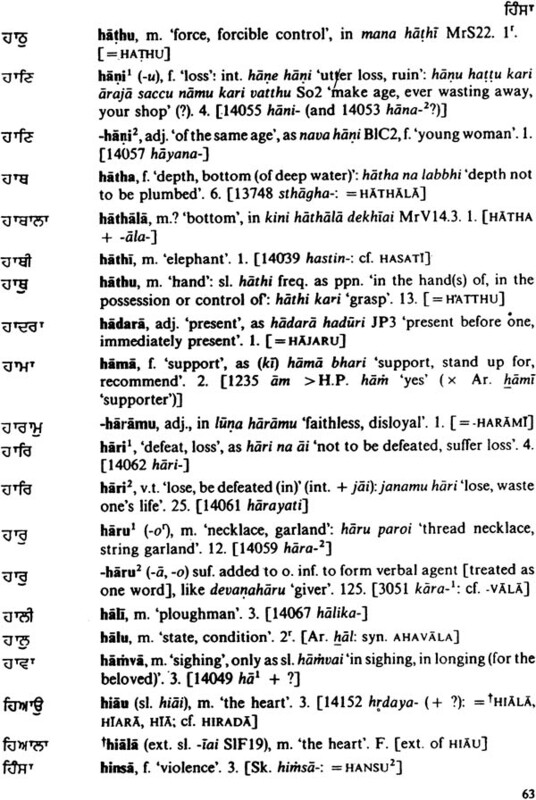 While the glossary naturally relies heavily on the labours of Sikh scholars, it is not simply an English adaptation of existing Panjabi materials. This applies particularly to the etymologies, of such importance in determining the overall character of an old literary language, and sometimes of vital help in deciding the probable meaning of obscure words no longer in use. 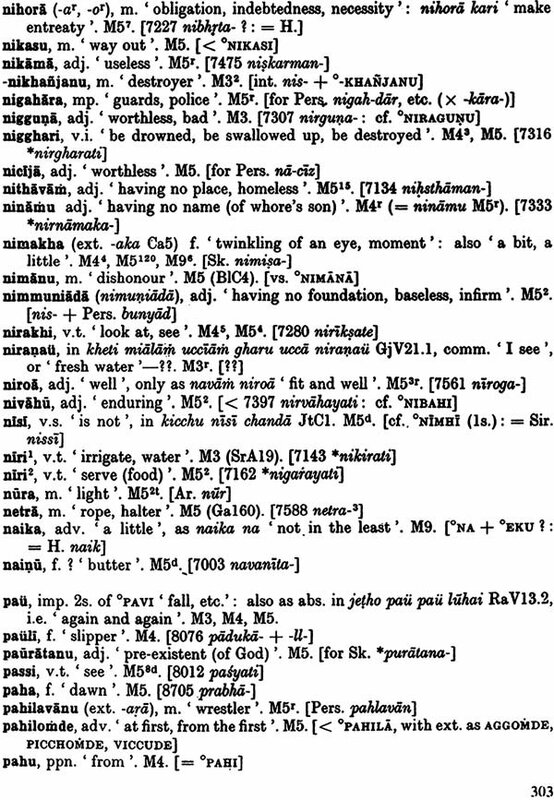 Here many fresh insights into points of detail have been made possible by Sir Ralph Turner's indispensable work, A Comparative Dictionary of the lndo-Aryan Languages [CDIAL: bibliography, no. 41]. 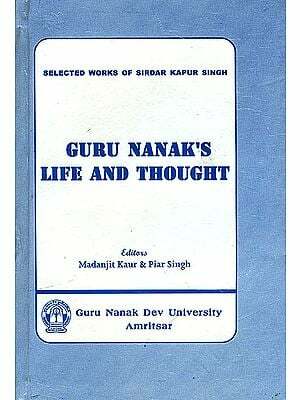 It is hoped that these will be found helpful by scholars concerned with the interpretation of Guru Nanak's language. The other recently published work without which the glossary could not have been compiled is Gurcharan Singh's index verborum of the Adi Granth [no. 2]. Although this gives numerical references only, without definitions or distinctions between homonyms, it made it possible to compile an initial comprehensive selection of words. These were then checked for context against the most reliable edition of the standard text of the Adi Granth [no. 8], as well as the other principal commentaries [nos. 10, 17, 18], and the main dictionaries [nos. 3,16]. After reference to the CDIAL and to dictionaries of other languages [bibliography, part B], the existing entries were eventually obtained. 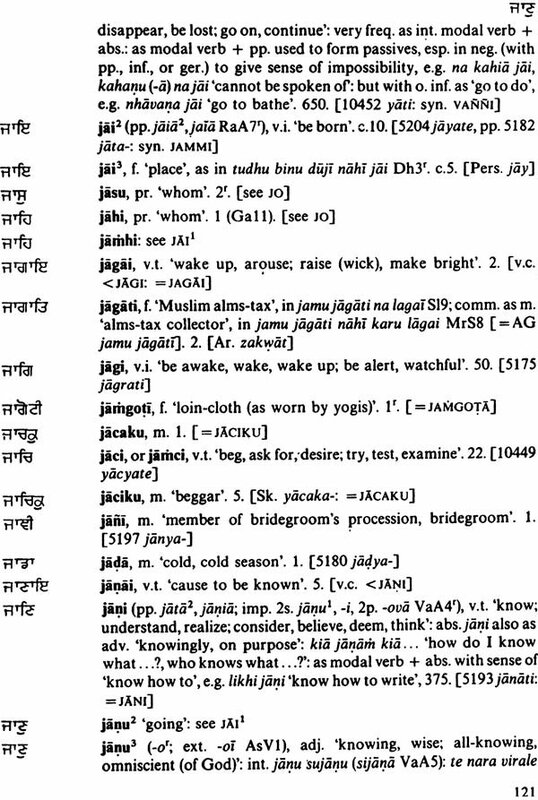 A full entry begins with the head-word in Gurmukhi and romanized transcription, with noteworthy inflexions and variant forms following in round brackets, and grammatical labelling. This is followed by the English definition. Derivative phrases and idiomatic uses are then listed and defined, and problematic contexts discussed. Next the frequency-count is given. Finally the etymology is explained in square brackets, together with cross-references in small capitals to immediately related words or close synonyms. This full pattern is only sometimes encountered, since entries have been kept as brief as possible [see also the list of signs and abbreviations below]. 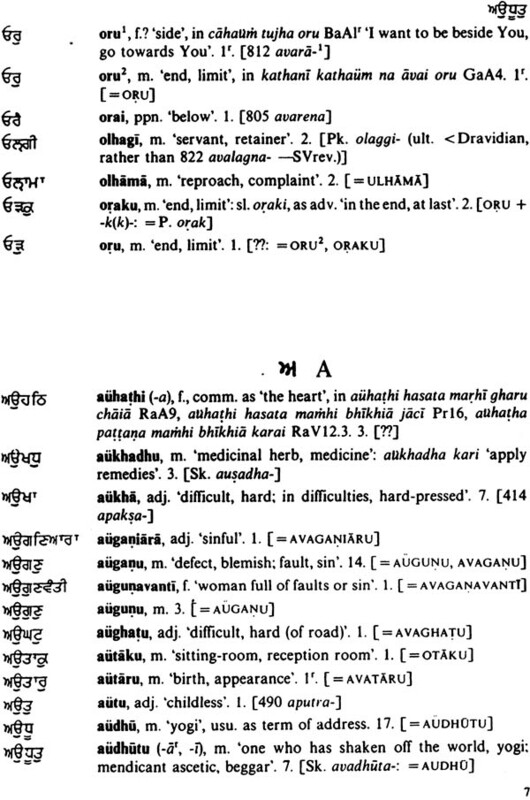 The Gurmukhi head-words are arranged in the order explained in the following section on transcription. They are written with the maximal pointing which actually occurs. This will not necessarily be the form most commonly encountered in the text of the Adi Granth, which makes sparing use of the subscript letters and marks of nasalization. Nouns are given in the commonest form of the singular direct case, and adjectives in the masculine singular direct. Verbs are given in the absolutive (normally ending in -i). This has the advantage over the infinitive, the normal citation-form in the modern languages, of being more frequent in occurrence and standard in form. It is also alphabetically closer to the stem-form, which cannot itself be used as the citation-form without violating one of the most characteristic features of the Gurmukhi script, the lack of distinction between simple consonants and consonants + -a. Other words appear in their commonest form. The inflected forms of pronouns are so varied that they are listed as separate words. Otherwise only those inflected forms which are widely separated in alphabetical order from the head-word have been accorded separate entries. 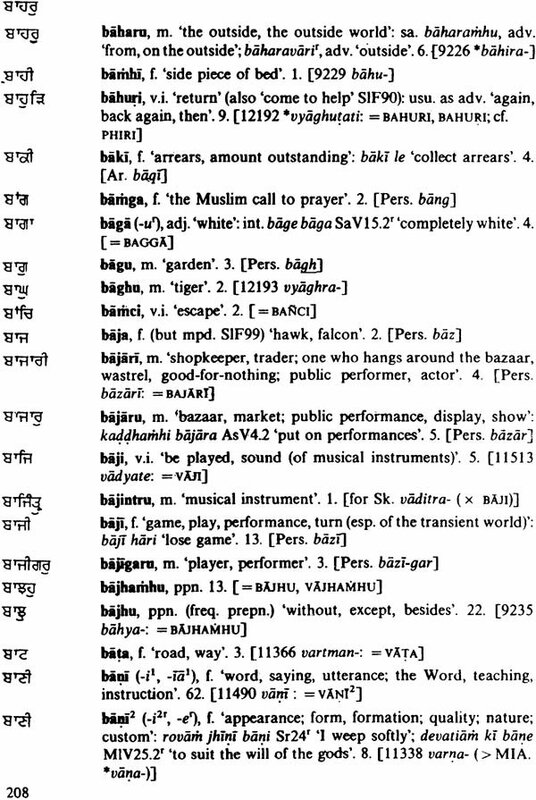 The romanized transcription in bold type includes the maximum number of features which etymology, together with the metre, allows to be read into the Gurmukhi, including doubled consonants, aspiration of sonants, and nasalization of vowels. The dagger used before transcriptions indicates an additional word not found in Guru Nanak, There are about 350 of such entries. Alternant vowel-endings of the singular direct of nouns and adjectives are given in brackets, together with extended forms and unusual inflexions. Similarly, only irregular or unusual conjugated forms of verbs are given in the brackets. Any attempt at a more comprehensive listing could only be done in a separate systematic account of the grammar of Guru Nanak's language. The English definitions have been kept as brief as possible. They are omitted altogether from the less common of alphabetically close pairs of synonyms, like the many pairs differing only by a single consonant. Here it has been thought sufficient to give a cross-reference to the commoner form. Terms relating to classical Hinduism, including names of gods and others, are given in their standard form, as if transliterated from Sanskrit. This makes it unnecessary to give a separate etymology for most names. Nominal compounds are written inconsistently as one or two words in printed editions of the Adi Granth. Compounds of fresh meaning or special importance are entered here as separate single words, other compounds appearing as two words under the head-word with separate definitions. Words appearing only as the second member of compounds are listed separately, and marked with an initial hyphen. The emphasis of the glossing is on linguistic rather than theological definition. Idiomatic phrases are fully glossed, but predictable or untranslatable phrases, like nominal conjunct verbs or intensive compounds, are often simply listed. Problematic verses and contexts are quoted in full with references [see table below], with an English translation of the disputed phrase, though not necessarily of the entire quotation. Fresh interpretations are sometimes suggested, usually on etymological grounds. These re-interpretations are for the most part tentative only, so the most important or the least unlikely suggestions of the commentators are also given in English. No attempt is made to distinguish between commentators, but most references are to the standard commentary of the Sabadarath [no. 8]. 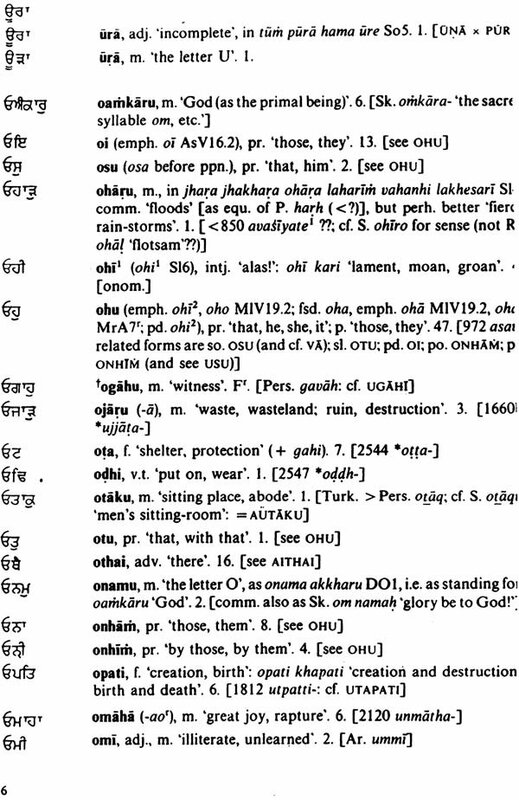 Since an index verborum of the Adi Granth now exists, there was little point in adding enormously to the bulk of this glossary by providing full textual references for each word. Instead, frequency-counts have been given for each entry. These will be found to provide many interesting insights into Guru Nanak's choice of vocabulary, and into the overall character of his language. Large numbers have been rounded out to avoid giving a false impression or' precision. It is not always possible to be precise in assigning forms to homonyms, and here approximate figures have been given. Frequency-counts for irregular past participles usually appear in brackets, indicating that they have also been included in the total given for the verb under its absolutive. Some compositions of Guru Nanak are given in more than one place in the Adi Granth, and such repetitions have been disregarded in establishing frequency- counts. 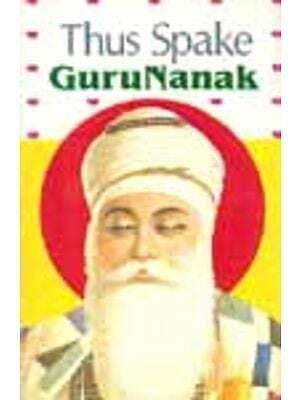 No counts are given for the additional words not found in Guru Nanak, where a siglum instead indicates the author. Nearly all such words are used once or twice only.